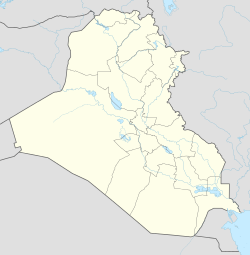 The 5 January 2012 Iraq bombings were a series of attacks that hit the capital Baghdad and the southern city of Nasiriyah and appeared to target Shia Muslims. A suicide bomber attacked a security checkpoint as huge crowds of pilgrims were making the journey from Nasiriyah to Kerbala for a religious holiday. At least 44 people were killed and 81 more injured in the first significant attack in the city since a blast targeted the Italian military headquarters in November 2003. Meanwhile, in Baghdad, at least three bombs exploded in Sadr City next to a group of day laborers waiting to get hired. Interior Ministry officials confirmed at least 13 died in these attacks and 32 were injured. Several hours later, two car bombs in the Kadhimiya district of Baghdad left 16 dead and 36 injured. In addition to these attacks, two people were killed and six injured in a shooting and roadside bombing in the insurgent stronghold of Mosul. On 6 February 2012, the Islamic state of Iraq claimed responsibly for the attack. ^ "Wave of bombings leaves scores dead in Iraq". Al Jazeera. 5 January 2012. Retrieved 5 January 2012. ^ a b "FACTBOX-Security developments in Iraq, January 5". Reuters. 5 January 2012. Archived from the original on September 14, 2012. Retrieved 5 January 2012. ^ "Iraq's Al Qaeda claims 2 deadly attacks on Shiites". Fox News. 6 February 2012. This page was last edited on 30 March 2019, at 12:29 (UTC).